Click the button below to add the Trogotronic Iron Cross to your wish list. As the originator of the “Crude Audio Interface”, Trogotronic’s unique road-tested controllers are unmatched instruments of premium build & finish to this day. From the start Trogotronic sought playability & meaningful control of audio sources with the most elementary means. 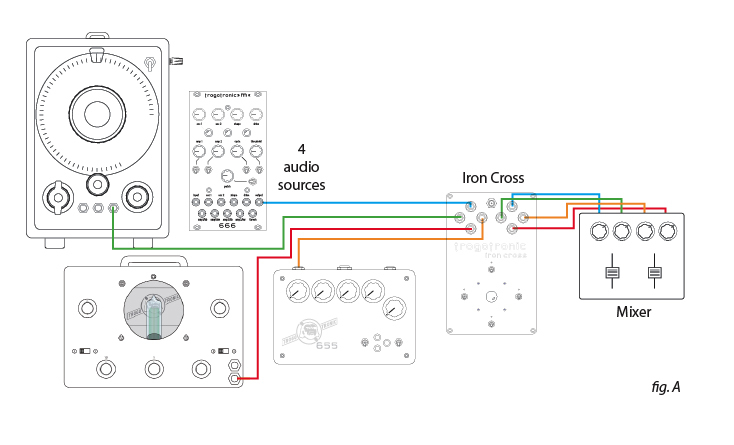 The Iron Cross III is painstakingly purpose-built with hand-wired “point to point” construction to control unorthodox sound sources that lack intuitive integration/operation (such as systems which use alternative audio and effects: pedal chains, oscillators, microphones, circuit bent gear, recordings and so on). Each channel (One through Four) is assigned a direction: 1. “north” 2. “east” 3. “south” 4. “west”. Each channel is activated as the stick is pushed in its direction. Upon release the channel is silenced as the knob returns to center. Pairs of consecutive channels are played simultaneously in diagonals (say, “north-east” or “south-west”). Hold toggle switches override any of the four channels ignoring position of the stick while Indicator lamps alert that a channel is in Hold mode. “North” channel input is the Master Channel; When nothing is plugged into the other inputs Master Channel signal will be distributed to all four outputs. Expletives! …etc., all at high speed; all in real-time. What’s more it’s intuitive design concept make the controls + ins & outs’ relationship to one another obvious at a glance. Although the idea is silly-simple, it’s applications are myriad. Fig. A (4) discrete sound sources fed through the Iron Cross, then to four discrete channels on a stereo mixer. In this way each of the (4) sounds can be summoned at will via the Iron Cross console. Fig. B (1) sound source is patched to the Iron Cross Master Channel; then out to (4) discrete effects with each of those patched to it’s own discrete channel on a stereo mixer. In this way 1 sound can be effected at will with one or all of (4) unique effects via the Iron Cross console. Iron Cross III is more compact than ever & ships in a handsome low profile aluminum chassis with specifications explained below in red type.